YouTube is a great platform to market your products and make money. You can create videos with a mobile camera within a few minutes, edit them using video editing software, and upload to your YouTube channel to get views. Google AdSense integration will help you to monetize each user clicks and earn depends on the popularity of videos you made. People can watch your videos by visiting the homepage of your YouTube channel and subscribe to get notifications on new video uploads. They can analyze your channel’s growth by counting subscribers and video views. It won’t be a matter to the channels with thousands of followers. If not, you may want to hide the subscribers count from the public. In this post, we’ll tell you how to hide your YouTube subscribers count in simple steps. 1. First, sign into your YouTube channel. Click the profile picture on the top-right corner of your screen. It will show a number of related settings. 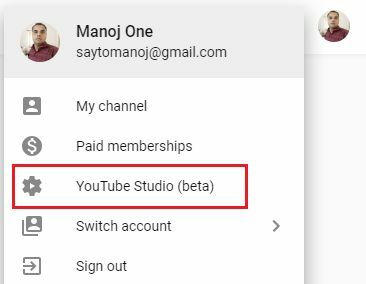 Choose ‘YouTube Studio(beta)’ from the list. 2. Now you will be redirected to the new YouTube channel dashboard where you can manage the settings, monitor traffic, and others. Click ‘Settings’ from the left pane. A box will open. Tap ‘Other Settings’ followed by ‘Advanced channel settings’ option. A new browser tab will open with advanced tools and features. 3. Scroll down to the bottom to find ‘Subscriber Counts’ settings. Select ‘Do not display the number of people subscribed to my channel’ option. Click Save button to confirm your changes. Done. People won’t see your YouTube subscribers count thereafter. If you want to enable it again, select ‘Display the number of people subscribed to my channel’ in the last step and Save.